Mon Guerlain, the House's new fragrance, is a tribute to today's femininity - a strong, free and sensual femininity, inspired by Angelina Jolie. The fresh oriental fragrance enhances exceptional raw materials: Carla Lavender from Provence, Sambac Jasmine from India, Album sandalwood from Australia and vanilla tahitensis from Papua New Guinea. It expresses the quintessence of a history replete with experiences, nourished by success, expertise and generosity, all infused with the same passion since 1828. The “quadrilobe” bottle, created in 1908, established itself as one of Guerlain's iconic bottles. Simple and graphic, it echoes an alchemist's bottle and owes its name “quadrilobe” to its stopper, which is formed from one piece to obtain a shape resembling four lobes. One century later, beautifully enhanced by a luxurious glass weight and a golden adornment, this bottle offers a contrast between strong taut lines and sensual curves, expressing contemporary femininity. Explore the entire range of Perfumes (EDT & EDP) available on Nykaa. 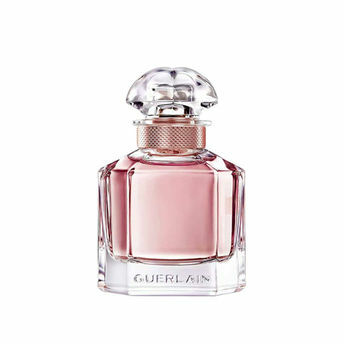 Shop more Guerlain products here.You can browse through the complete world of Guerlain Perfumes (EDT & EDP) .Alternatively, you can also find many more products from the Guerlain Mon Guerlain Eau De Parfum Florale range.